Charles “Chuck” Stone, Jr., pioneering African American newspaper columnist, editor, author, and professor was born on July 21, 1924 to Charles and Madeline Stone in St. Louis, Missouri. Soon after, the family moved to Connecticut where Stone’s mother worked for the Hartford Board of Education and his father was business manager at a local college. Stone graduated with honors from Hartford Public High School in 1942, just as the United States was entering World War II. After being drafted in 1943 he became one of the Tuskegee Airmen, serving in the Army Air Corps as a flight navigator. Once the war ended Stone, who had been accepted to Harvard, decided to attend Wesleyan University instead where he earned a bachelor’s degree in English followed by an M.A. in sociology from the University of Chicago. Stone then worked for the humanitarian organization, Cooperative for Assistance and Relief Everywhere (CARE), in India and Egypt between 1957 and 1958. Upon returning to the United States, Stone worked various jobs for several African American newspapers. 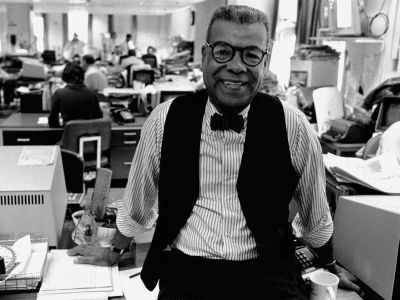 He became a reporter and then editor for the New York Age in 1958, White House correspondent and editor of the Washington Afro-American in 1960, and editor-in-chief at the Chicago Defender in 1963. Stone began to write articles critical of Chicago mayor Richard J. Daley and was eventually fired in 1964 after refusing his publisher’s request to stand down on the issue. Stone then gravitated toward politics, working for Harlem Representative Adam Clayton Powell, Jr. as a speech writer. During this time Stone became friends with civil rights icons like Martin Luther King, Jr., Malcolm X, and Stokely Carmichael. After Powell was defeated in 1970 Stone, who to that point had worked for black newspapers, became of one the first African American journalists in the mainstream press when he eventually began writing for the Philadelphia Daily News in 1972. Over his time at the News Stone was known for his social commentary and relentless condemnation of the city’s political corruption. Stone’s criticism of the Philadelphia Police Department’s record of brutality toward African Americans led several black criminal suspects to seek a measure of protection by in effect surrendering to Stone before being arrested by the police. In addition to assisting more than 75 fugitives in this way, Stone negotiated the safe release of six hostages being held by rioting inmates at a Pennsylvania prison in 1981. Stone served as founding president of the National Association of Black Journalists (NABJ) from 1975-1977. He received two Pulitzer Prize nominations, and after serving as political correspondent and senior editor at the Philadelphia Daily News, Stone left the paper in 1991. Having taught college courses intermittently since the early 1960s, Stone became a full-time faculty member in the School of Journalism and Mass Communications at the University of North Carolina at Chapel Hill in 1991 and held that post until retiring in 2005. Stone published four books: Black Political Power in America (1968), Tell It Like It Is (1968), King Strut (1970), and Squizzy the Black Squirrel (2003). Stone was married to Louise Davis on October 4, 1958. They had three children: Krishna, Allegra, and Charles III. Charles “Chuck” Stone died on April 6, 2014 in Chapel Hill, North Carolina.